For those of us who grew up in Eton Wick, the Annual Show organised by the Eton Wick Horticultural Society, held on a Wednesday in August, was the highlight of the summer. We remember big tents with long trestle tables laden with the best vegetables, fruit and flowers from gardens and allotments, the children's collections of wild flowers and grasses and the very popular `Garden on a Plate'. There were prizes for the best cakes, jam, honey and other food items; ladies and girls entered needlework and there was craft work from the men and boys. All work was to a very high standard. Outside the tent, in cages, were the best of the poultry, rabbits and other livestock bred in the Society district, which seemed to cover Eton Wick, and Eton with the surrounding villages of Boveney, Dorney, Clewer and Chalvey. There was a tug-of-war for the men, races for the children and mothers, bowling for a pig, guessing the weight of the cake, and sometimes the pig! There were coconut shies and swings, a beer tent, darts, rolling the penny and other money-raising attractions. In the evening after a 'celebrity' had presented the prizes, there would be dancing to the band which had been playing throughout the day. We all enjoyed it and looked forward to next year's Show but did we ever wonder how it all began? From the old Eton Parish Magazines, the first of which was published in January 1878, the following is found. "It is to be hoped that this effort will prove successful and will receive the encouragement it deserves from all classes in the Parish." "a numerous gathering of the inhabitants of Eton Wick took place on Wednesday after-noon last, on the occasion of the first exhibition of the Horticultural and Industrial Society... the weather was most propitious and the music rendered by the two bands in attendance added much pleasure to the scene. The various articles exhibited were minutely inspected by the assembled company, having been tastefully arranged for the occasion." The Show seems to have been run along much the same lines for all the years it was held. The exhibits were grouped in seven or eight divisions with several classes in each, but with some new classes as the years went by and others removed as times changed. The word 'industrial' was eventually dropped and it became known as The Horticultural Show, or just The Show. Reports in the Parish Magazine were very detailed for thirty five years but became less so after the First World War. The day, the month and the venue of the Show changed from time to time. In 1884 it was held on a Thursday, in a field belonging to the Local Board of Health (this was the Eton Sewage Farm at Bell Farm)... "by kind permission of Mr. Tough", the Society's Treasurer. In 1891 the Show was held at College Eyot in Eton but it was not so successful and the takings at the gate were down. On several occasions it was held in the Reverend Hale's orchard (Wheatbutts). The Reverend Hale died in 1894 and Mr. Edward Littleton Vaughan, a housemaster at Eton College (and a great benefactor of Eton Wick for more than fifty years) became the occupier of Wheatbutts and that is where the Show was held from 1895 onwards. 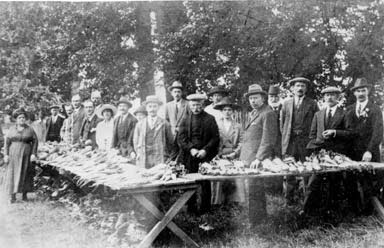 From 1911 to 1914, the Show took place on August Bank Holiday Monday. From 1922 to 1939 it reverted to a Wednesday afternoon which in those days was early closing day for most shops; and so the Show went on, the pride of Eton Wick, spanning more than sixty years. There was always music throughout the day and during the first few years it was provided by the Eton Wick Drum and Fife Band who, in 1887... "were looking very smart in their new uniforms." Later reports speak of the Windsor Volunteer Town Band, The Chalvey Brass Band, The Egham and Englefield Brass Band, The Yiewsley and West Drayton Prize Band and the Slough Police Band. In the early years, the money prizes seemed quite valuable in relation to a labourer's wages. Prizes of one guinea, ten shillings and sixpence, seven shillings and sixpence, five shillings, and two shillings and sixpence were typical. Useful articles were also awarded, for example a large loaf presented by Mr. Lovell, baker of Eton Wick and the same by Mr. Grove of Dorney. A garden fork presented by Mr. Duffield and a pound of tea by Mr. Pratt the grocer; half a ton of coal, a butter dish, a pair of spoons and even a teapot! There was usually a prize for a collection of natural objects (excluding birds' eggs) and in 1882 Mr. W. Marshall was awarded a prize for his collection of English snails! There was often a display of produce which was not for judging but just to be admired; in the same year it was reported: "Mr Tough again sent, from the Eton Sewage Farm, a collection of wonderfully grown wheat, oats, cabbage and other produce." "A valued school teacher at Eton Wick and a member of the Church Choir, Mr. Robert Trotter, has just started with his wife and child to Brisbane. Thus, no more competition for Mr. Trotman from Mr. Trotter!" For many years, in the needlework classes there was something called 'Marking'. I didn't know what this was and failed to find the answer in a dictionary. The Women's Institute craft leader didn't know either but we finally decided that it must be a type of embroidery used to mark linen. Girls going into service would need to know how to mark their garments. Had Cash's embroidered name tags been invented in the 1880s? Even if they had, a girl just starting out in work could not have afforded them. In 1888 the first allotments in the Parish were instituted by the Church of England Temperance Society. These were in Eton and there were sixty plots of ten poles apiece. It was not until 1894, when Eton Wick was separated from Eton and became a civil parish with the Eton Rural District, that several parcels of land throughout the village were leased from the Crown for allotments. "The Annual Show was originally started to benefit the labouring classes rather than the artisan class in the Village, and of late years it has ailed in this particular." "to bring the Society back to its original object." The general verdict was that the exhibition of 1892 had formed a starting point for better shows in the coming years. The entries of 'Best Cooked Dinner' had always fascinated me and I found that this class was introduced in 1893. Two prizes of twelve shillings and sixpence and seven shillings and sixpence were given by Mr. P. Williams of Eton College. According to the report, the entry was limited to one dish and one family and to an outlay of one shilling. The size of the family was not determined! A falling off in the number of exhibits was frequently reported and often it seemed that the Committee barely covered its expenses, or even ran at a loss. In 1896 the 19th Annual Show was very disappointing, and the villagers were admonished for not supporting the Committee. "who spared neither pains, time nor money to make the Show a success... the vegetables and flowers were quite average quality but miserably few as regards number of exhibits. If the Show is to continue, and to be in the future what is has been in the past - the gala day of Eton Wick - then the inhabitants must back up the sterling, self-sacrificing work of the Committee by making honest efforts to increase the number and quality of exhibits." 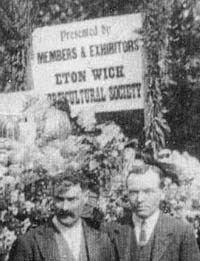 Eton Wick Horticultural Show c 1900 - THE event of the year. Among the Industrial exhibits in 1904 was a Swan and Lake scene cleverly made of fish scales and Mr. Borrett of Jersey Farm displayed two live wasps' nests among the Honorary exhibits! From mid-1917 to 1920, no Parish magazines were published due to the 1914-1918 war but in March 1920 a Public Meeting was called by the remaining members of the Society to discuss its future. There are twenty two names on our War Memorial, so I wonder how many members of the Society had survived to attend that meeting? The report stated: "The question before the tillage is whether the old society is to die or live, and if it is to live, what means should be taken to give it vitality?" "We are sorry to say that the gate money does not fully represent the attendance, as quite a number of people were mean enough to make their way in by unintended ways to avoid paying the small entrance fee." 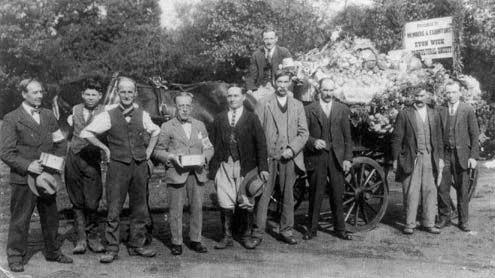 The horse and cart loaned by Bert Bond the greengrocer, and laden with produce donated by members of Eton Wick Horticultural Society, prepares to leave Eton Wick to join the procession taking part in King Edward VII's Hospital Parade around Windsor c1931. Bert Benham (not believed to be related to the Benham on the left) and Harry Young. The Show of August 1939 was "the best ever". Then came the 1939 -1945 war and the Horticultural Society was not mentioned again in the Parish Magazine. In November 1942 when 'Dig for Victory' was the slogan, it was reported that The Eton Wick and Boveney Allotments and Produce Association had been started. After the war, the Allotments Show Tent became a feature of the Scout Fete. Later, for a few years, a small Show was held in the Village Hall. In 1934 the Parishes of Eton Wick and Boveney became part of the Eton Urban District. In the 1950s when the Council needed land for housing, the allotments were among the few large sites available, but Eton Wick allotments were on Lammas land which, by law, could not be built on. However, Lammas land could be exchanged for land which was not subject to Lammas Rights. Eton Council's former sewage farm at Bell Farm was such a site and the allotments were re-located there. Eton Wick now has a thriving Allotments Association which is greatly valued by the community. Those who do not rent a plot can become Associate Members for £1 a year and on Sunday mornings we can go to the 'allotment shed' and buy compost, fertiliser, seeds, plants and other items for our gardens; but the Horticultural Show is just a happy memory.